Factoring out the tension between them in the show’s fifth season, Marcus and Abby have been the longest-lasting romantic pairing on The 100. That’s not luck. That’s years of knowing and understanding each other before they went to the ground. That’s years of supporting each other’s leadership through disputes and near-death experiences. That’s being willing to die for each other, time and time again. Though they’re not in a great situation right now (blame cannibal Vinson for taking a chunk out of Marcus, forcing Abby to put him in cryosleep) if Abby’s love for her beau could translate into healing powers, he’d be walking around in no time. Rick’s still alive, so there’s still hope! Before Rick departed The Walking Dead via helicopter, his romance with Michonne was easily one of the strongest examples of genuine love on the show. There was never contrived drama between them for the sake of drama — no cheating, no “breaks,” no screaming matches or storming out — and when they did have problems, they solved them by listening to each other and finding out the best solution to whatever survival crisis was facing them together. “We don’t die,” indeed. Their separation wasn’t of their own volition, but the flashback scenes in “The Worst Possible Use of Free Will” prove just how good Eleanor and Chidi really are together. Though they, like Jake and Amy, are total opposites, Eleanor and Chidi’s love is built on a foundation of sacrificing for each other and making the other person better. They celebrate each other’s successes and help them work on their flaws, and ultimately understand each other better than anyone else ever could. None of the couples on this list have had things easy, but Jamie and Claire might have endured the widest range of troubles that threatened to split them apart. They’ve been ripped apart by time travel, tested through various imprisonments and captures and 18th century struggles and, perhaps most devastatingly, war. Despite spending decades apart, Jamie and Claire’s love for each other never wanes and their bond remains as strong as ever even when they’re separated by hundreds of years. Jake and Amy prove the old saying “opposites attract.” These two couldn’t be more different from each other; him, a messy (but loveable) detective with an uncanny knack for solving cases; her, a straight-laced sergeant with a binder for everything and everything in a binder. Their love for each other is so sugary sweet, it carries a cavity risk — and because he doesn’t go to the dentist, Jake probably has a few of those. And Amy loves him anyway. Yes, another pairing from The 100, but they couldn’t be left off this list. Monty and Harper might be the only pairing on their show to get a truly happy ending, even though it came as a saddening surprise to their friends. They were able to spend years together in space and even had and raised their son, Jordan Green. Though finding out about their deaths was bittersweet, it’s lovely to know they stayed together through all those cold years in space, and helped each other find joy in that darkness. At the end of the world, they finally got what they wanted and what they absolutely deserved: peace. So sweet, so innocent, so full of emotion. Mike and “El” were the heart of Stranger Things’ second season, and El’s moments of heartbreak over Mike were as painful as their reunion was joyful. That said, there’s rarely any drama between the two of them when they’re together — after all, they’re too young for that — but the purity and earnestness with which they care for each other is refreshing. Let’s hope they don’t spend all of Season 3 separated! You can’t really have this list without them, can you? Though Jack and Rebecca have had their ups and downs, they’re a clear-cut example of true love. After all, true love isn’t never fighting or never disagreeing; it’s being willing to see the other person’s side, and helping them through the darkness when they can’t turn on the light. In that, Jack and Rebecca certainly excel. 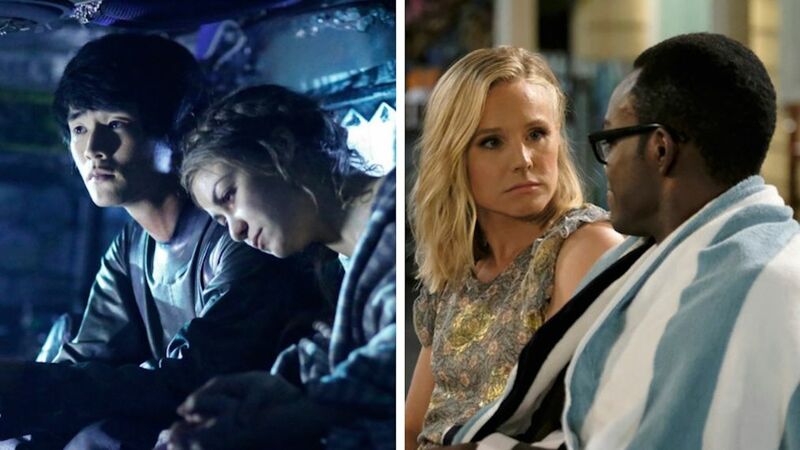 On TV, there sometimes seems to be two constants when it comes to romance: drama, and more drama. Couples break up only to make up a few episodes later, cheat on each other, deny their feelings for each other until it's too late or pine for each other for years (and sometimes they don't even end up together after that). While these things aren't inherently bad — they definitely make for interesting television! — sometimes it's nice to appreciate the steady, constant pairings that remain the same despite the chaos around them. Here are nine strong TV couples who have stayed together even if their worlds were falling apart.